Iron Man 3 DVD and Blu-ray Announced and Detailed. Robert Downey Jr., Gwyneth Paltrow, Guy Pearce and Ben Kingsley star in the third installment of the superhero action-adventure. View the special features and movie trailer below. 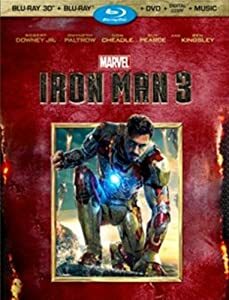 Iron Man 3 is available for pre-order on Three-Disc Blu-ray 3D / DVD Combo, Two-Disc Blu-ray / DVD Combo, Blu-ray / DVD Combo and DVD. When Stark finds his personal world destroyed at his enemy’s hands, he embarks on a harrowing quest to find those responsible. MPAA Rating: (PG-13) for sequences of intense sci-fi action and violence throughout, and brief suggestive content. Marvel’s Iron Man 3 Unmasked: Join cast and crew for a crash course in epic movie-making, Marvel style. Tags: Ben KingsleyDon CheadleGuy PearceGwyneth PaltrowIron ManIron Man 3Rebecca HallRobert Downey Jr.